Sidney’s Keith Lee shoots shoots during a Greater Western Ohio Conference crossover game against Stebbins on Tuesday in Riverside. Lee scored a career-high 16 points in the game. Sidney’s Trey Werntz shoots during a Greater Western Ohio Conference crossover game against Stebbins on Tuesday in Riverside. Sidney's Ratez Roberts shoots with pressure from Stebbins' Ryan Hickey during a Greater Western Ohio Conference crossover game against Stebbins on Tuesday in Riverside. Sidney's Ratez Roberts shoots during a Greater Western Ohio Conference crossover game against Stebbins on Tuesday in Riverside. Sidney's Darren Taborn shoots during a Greater Western Ohio Conference crossover game against Stebbins on Tuesday in Riverside. Sidney’s Andre Gordon shoots during a Greater Western Ohio Conference crossover game against Stebbins on Tuesday in Riverside. Gordon scored 19 points. 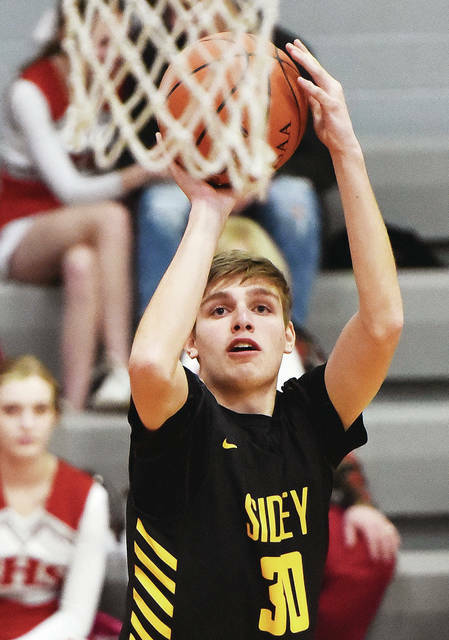 RIVERSIDE — Sidney was coming off of its first loss in over a month and was hoping to bounce back in a Greater Western Ohio Conference crossover game at Stebbins on Tuesday. 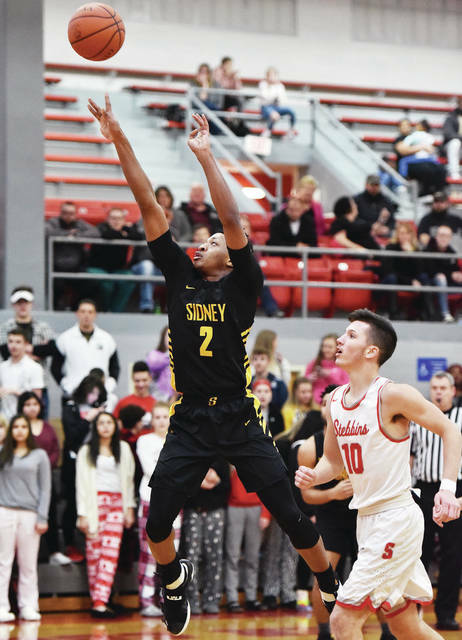 The Indians didn’t make it easy, but Sidney overcame a one-point deficit at the half and won a hard-fought contest 64-52. The victory improves the Yellow Jackets to 11-2 overall and 8-1 in GWOC American League play. They were coming off a 63-61 loss to Fairborn, which was their first defeat since a 63-44 loss to Mason on Dec. 1. Sidney trailed 31-30 at halftime but switched to a 2-3 zone and held Stebbins to four points in the third quarter. Stebbins shot 13 for 21 from the floor in the first half with junior guard Damiene Boles Jr. scoring 13 points. Boles finished with 18 points. The second half was totally different as Stebbins could not hit shots against the zone. They also suffered a wave of turnovers in the third quarter, in which they had over half of their 13 total turnovers. Sidney outscored the Indians 14-4 in the third to take a 44-35 lead. Keith Lee, who scored a career-high 16 points, scored four points in the fourth to help the Yellow Jackets pull away. He hit two critical foul shots to give Sidney a 56-51 lead after Stebbins closed the gap in the fourth. After Lee’s free throws, Stebbins promptly turned the ball over and fouled Andre Gordon, who drained two free throws to increase the lead to seven. Ratez Roberts then canned two foul shots shortly after, and Gordon slammed a dunk after another turnover to ice the win. 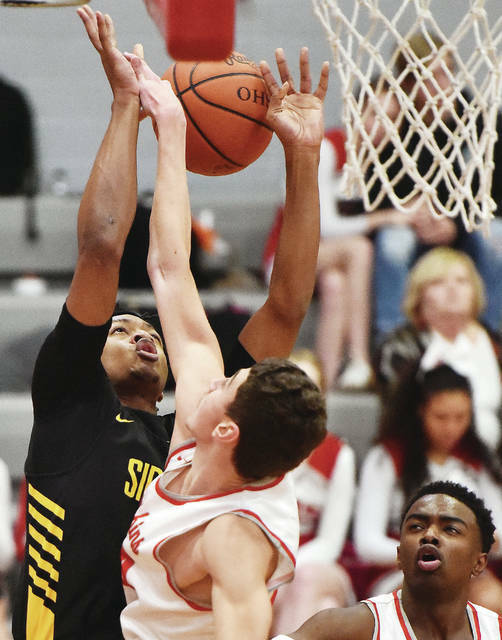 The Yellow Jackets will face their biggest challenge of the season on Friday in a GWOC crossover game when Trotwood-Madison travels to Sidney. The Rams (10-2, 7-0 GWOC South) are ranked No. 1 in Division II in the current Associated Press state poll and are averaging over 100 points per game. Trotwood is coming off a 95-80 loss to Pickerington Central in Flyin’ to the Hoop on Monday. The loss snapped a five-game winning streak. 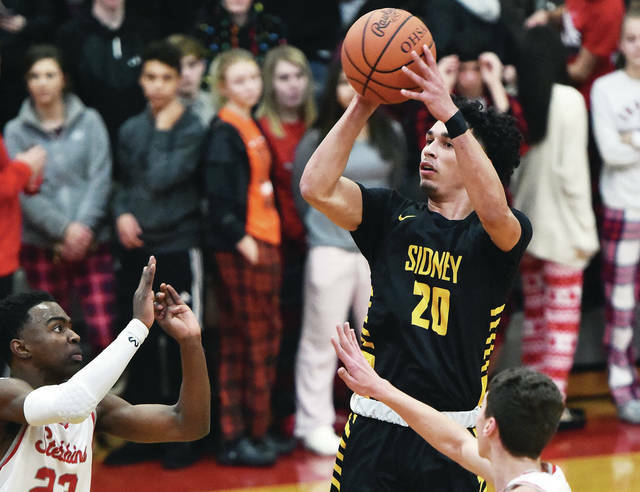 The game will be the first in a busy four-day stretch for Sidney. The Yellow Jackets will host Wapakoneta on Monday and Tippecanoe on Tuesday. 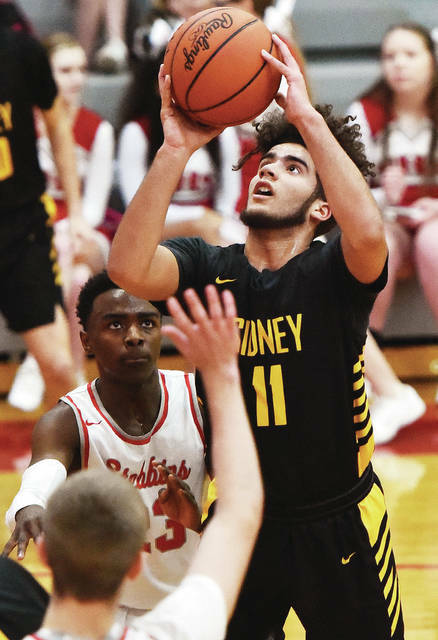 Sidney started off slow offensively against Stebbins, scoring just three points in the first five minutes. They scored more late but the Indians led 16-12 going into the second quarter. Sidney was able to get help from Stebbins by getting in the bonus for foul shots. Lee and Gordon made 8-of-12 free throws in the second to help cut down the gap. Lee drained a 3-pointer to cut Stebbins’ lead at 24-23 late in the second, and the Yellow Jackets later got their first lead of the game after Gordon made two foul shots. The Indians held the ball for the last shot and junior guard Jalen Tolbert hit a double pump shot to give the squad a 31-30 lead. Gordon led Sidney with 19 points and had four rebounds. Lee added three rebounds and Ratez Roberts scored 12 points and gathered nine rebounds with several blocked shots. Josiah Hudgins added nine points. Boles led the Indians with 18 points and four rebounds. Tolbert added 13 and Jake Reed scored 10 with four rebounds. Sidney’s Ratez Roberts shoots with pressure from Stebbins’ Ryan Hickey during a Greater Western Ohio Conference crossover game against Stebbins on Tuesday in Riverside. Sidney’s Ratez Roberts shoots during a Greater Western Ohio Conference crossover game against Stebbins on Tuesday in Riverside. Sidney’s Darren Taborn shoots during a Greater Western Ohio Conference crossover game against Stebbins on Tuesday in Riverside. 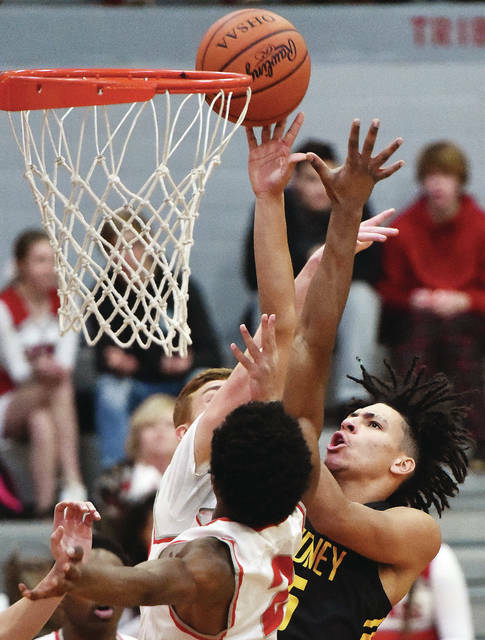 This entry was tagged American, American North, Andre Gordon, basketball, boys, boys basketball, Division, Greater Western Ohio Conference, GWOC, high school, Indians, Keith Lee, prep, Ratez Roberts, Yellow Jackets. Bookmark the permalink.